Temperature plays an important role as an indicator of the condition of a product or piece of machinery, both in manufacturing and in quality control. Accurate temperature monitoring improves product quality and increases productivity. Infrared technology has been utilized successfully in industrial and research settings for decades but now new innovations have resulted in non-contact infrared sensors offering faster and better measurements. In particular measurements can be taken of hazardous or physically inaccessible objects (high-voltage parts, great measurement distance); measurements of high temperatures (greater than 1300°C) present no problems (in similar cases, contact thermometers cannot be used). Furthermore there is no risk of contamination and no mechanical effect on the surface of the object. Every form of matter with a temperature above absolute zero emits infrared radiation according to its temperature. This is called characteristic radiation. The cause of this is the internal mechanical movement of molecules. The intensity of this movement depends on the temperature of the object. Since the molecule movement represents charge displacement, electromagnetic radiation is emitted. 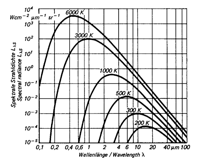 The spectrum of this radiation ranges from 0.7 to 1000 µm wavelength. For this reason, this radiation cannot normally be seen with the naked eye. Typical radiation of a body at different temperatures is shown in figure.The radiation maximum move toward ever-shorter wavelengths as the target temperature rises, and that the curves of a body do not overlap at different temperatures. The radiant energy in the entire wavelength range (area beneath each curve) increases to the power of 4 of the temperature. These relationships were recognized by Stefan and Boltzmann in 1879.The goal should be to set up the IR thermometer for the widest range possible in order to gain the most energy (corresponding to the area below a curve) or signal from the target. The greater the radiance difference per temperature difference, the more accurately the IR thermometer works.Previous figure shows the ideal case, the so-called "blackbody" radiation. Many bodies, however, emit less radiation at the same temperature. The relation between the real emissive power and that of a blackbody is known as emissivity ε and can be a maximum of 1 (ideal blackbody) and a minimum of 0. Bodies with emissivity less than 1 are called gray bodies. Bodies where emissivity is also dependent on temperature and wavelength are called non-gray bodies. A further reason for having devices for different wavelength ranges is the emissivity pattern of some non-gray bodies (glass, metals, and plastic films). There are various methods for determining the emissivity of an object. You can find the emissivity of many frequently used materials in a table. Emissivity tables also help you find the right wavelength range for a given material, and, so, the right measuring device. Particularly in the case of metals, the values in such tables should only be used for orientation purposes since the condition of the surface (e.g. polished, oxidized or scaled) can influence emissivity more than the various materials themselves. First method: Heat up a sample of the material to a known temperature that you can determine very accurately using a contact thermometer (e.g. thermocouple). Then measure the target temperature with the IR thermometer. Change the emissivity until the temperature corresponds to that of the contact thermometer. Now keep this emissivity for all future measurements of targets on this material. Second method: At a relatively low temperature (up to 260°C), attach a special plastic sticker with known emissivity to the target. Use the infrared measuring device to determine the temperature of the sticker and the corresponding emissivity. Then measure the surface temperature of the target without the sticker and re-set the emissivity until the correct temperature value is shown. Now, use the emissivity determined by this method for all measurements on targets of this material. The emissivity of a metal depends on wavelength and temperature. Since metals often reflect, they tend to have a low emissivity which can produce differing and unreliable results. In such a case it is important to select an instrument which measures the infrared radiation at a particular wavelength and within a particular temperature range at which the metals have the highest possible emissivity. The transmittance of a plastic varies with the wavelength and is proportional to its thickness. Thin materials are more transmissive than thick plastics. In order to achieve optimal temperature measurement it is important to select a wavelength at which transmittance is nearly zero. Some plastics (polyethylene, polypropylene, nylon, and polystyrol) are not transmissive at 3.43 µm; others (polyester, polyurethane, Teflon FEP, and polyamide) at 7.9 µm. Activity 1: Comparisons among different kinds of thermometers including infrared thermometers.